Day 120: Let The Countdown Begin! Man, I’m pumped! Today everything fell into place and all is set to hopefully end the morning of Sept 3rd. I pretty much know where I’ll be each day the rest of the trail. 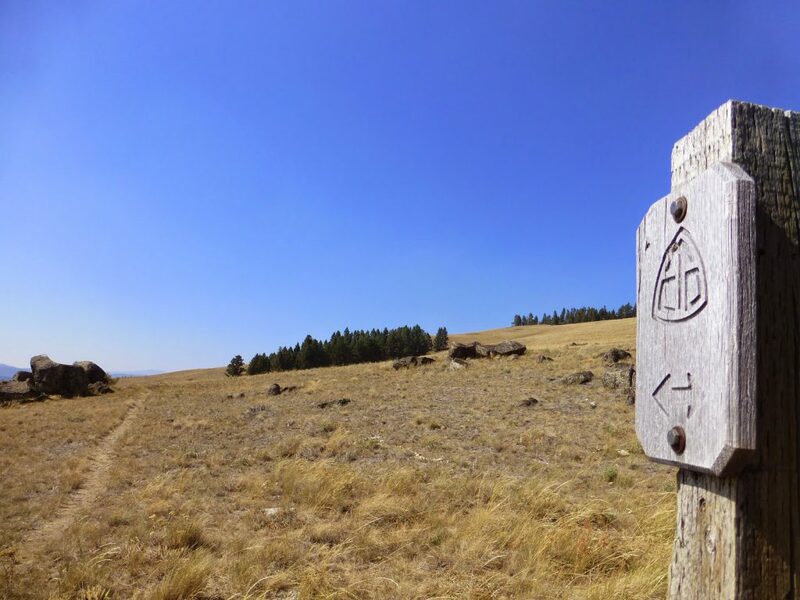 It is unique on the CDT ending in glacier because you have to reserve campsites there. That’s how I know the details of where I’ll be and when. Really exciting and Glacier is just a place I can’t believe I’m going to! I even have my post trail transportation booked(thank you Dana for your help!) as I will be taking a train to Chicago to spend a week there with my sister and nephews. I’ll found out that I even get to go to the Bears home opener in Chicago, which will be my first NFL game, which is shocking. So pumped about everything! I now have 14 days of hiking left and it includes a lot of great places that are highlights of the hike. The hiking will get more strenuous in a couple of days, so I’m appreciating this road walking and gradual inclines while I have them. I was in Helena getting things done until about noon today. I am working hard to respond to all the emails, phone calls, and questions that are coming in. If I haven’t replied yet, I’ll hopefully get to it soon or right after the hike in two weeks. I got a ride back to the trail from Kathleen(Dain’s mom). Dain came in later yesterday with Aquaman and Sweet As. 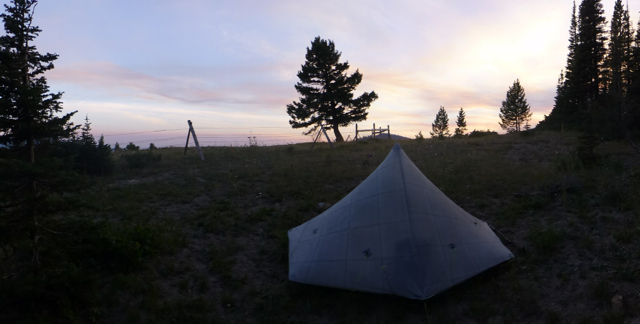 Also Speedbump(who I hiked with in 2011 on the PCT) and Estero made it in last night. Bloodbath and Rampage came in this morning. This whole group plans to hike out later today(except Dain who is zeroing) and will probably catch up to me in the next couple of days. Then I will stick with Bloodbath and Rampage to the end. Kathleen has been awesome and we joke that she is our new Beacon with all she is doing to help us all out. On our way to the pass, we saw another hiker along the road. It was E aka Elisabeth! I’ve been wanting to hike with E all hike. She is the first hiker I met the day before I started the trail. 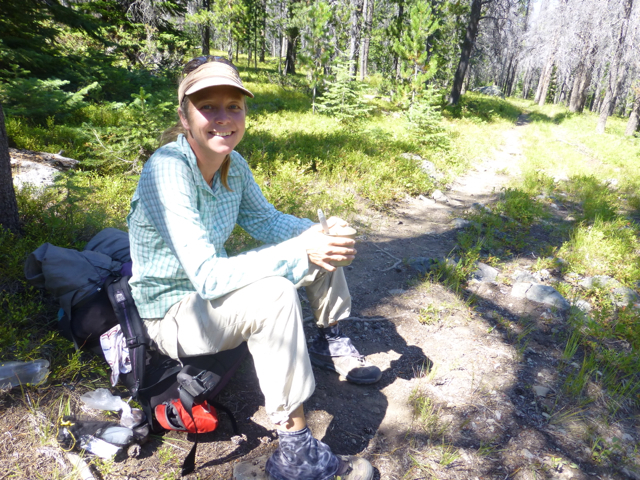 She was sitting at a cache in New Mexico three days into her hike and we were all caching water in preparation for our start. We have seen each other briefly in passing in town twice. She and another gal Neon (who is now just ahead of me) are the other two solo gals out here that I know of. They each took the Anaconda route and are now up here. E is battling a cold and was skipping Helena, so I was going to catch up to her in a couple hours as she was further down the road. Kathleen and I talked for a bit before I started hiking after stopping to talk to E. Then, as soon as I started hiking along the highway for a bit, two cross country bikers ride up. We immediately felt a bond as we are all doing the same sort of thing. I talked to them for a good 20mins (was I ever going to hike today!?) and they were great! 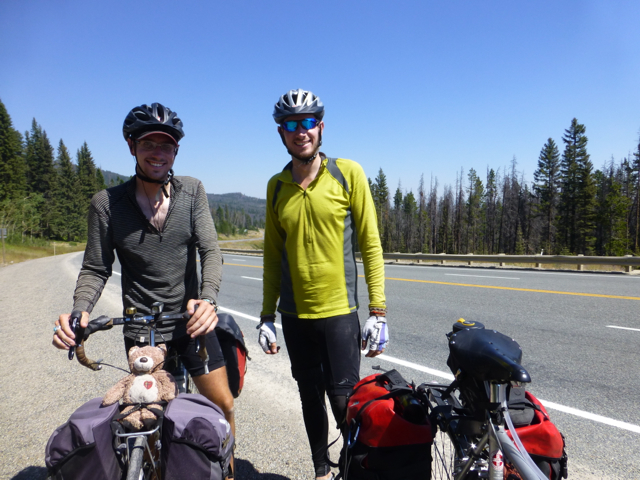 They were twins named Joe and Tom biking cross country from Virginia to Seattle and then down to Phoenix. We had surprisingly some of the same routes and we may all be in E Glacier the same night for dinner. What a great little world! Here are Tom and Joe. I finally started hiking and the weather was great today. Mild with a breeze in the 70s. Perfect! There are fires all around and the wind must have blown it this way because there was a faint smell and haze in the air. Nothing that should be affecting me hopefully. After a couple hours, I caught up to E eating an early dinner by a water source. We sat and talked about 30mins and I really wished I was able to hike more with her. I won’t see her again as she is on a different schedule. 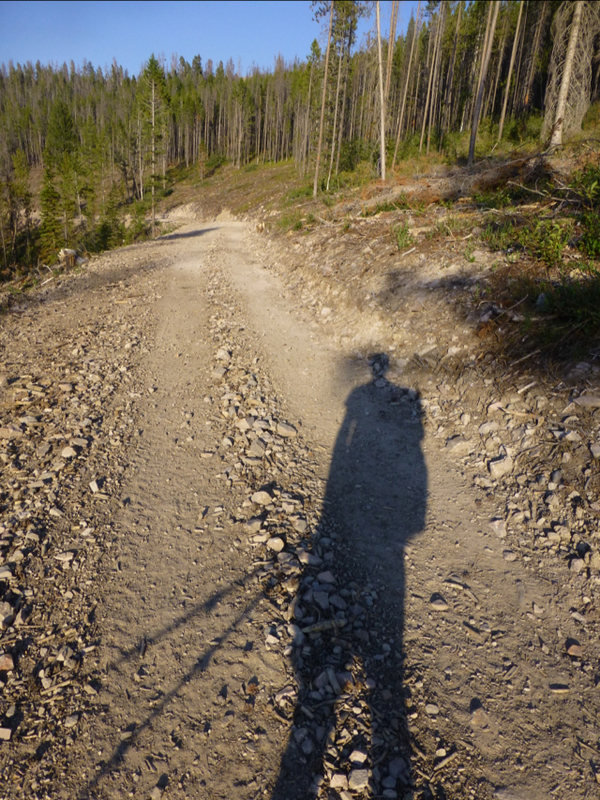 She really loves hiking solo and funnily thinks there were too many hikers on this trail this year, ha! It was great to visit for awhile though. She pointed out that the fresh footprints ahead of me are Neon’s and that she should be nearby. Maybe I’ll catch her tomorrow. She plans to go into the town of Lincoln in two days, so if I don’t catch her by then, I will have lost my chance to overlap with her too. It’s just cool to me that the three of us solo gals are within 10mi of one another and yet still hiking solo. Go girls! The majority of today was on dirt roads with many turns to pay attention to. I mentioned it a couple days ago, but here is a photo of one of the resources I use. 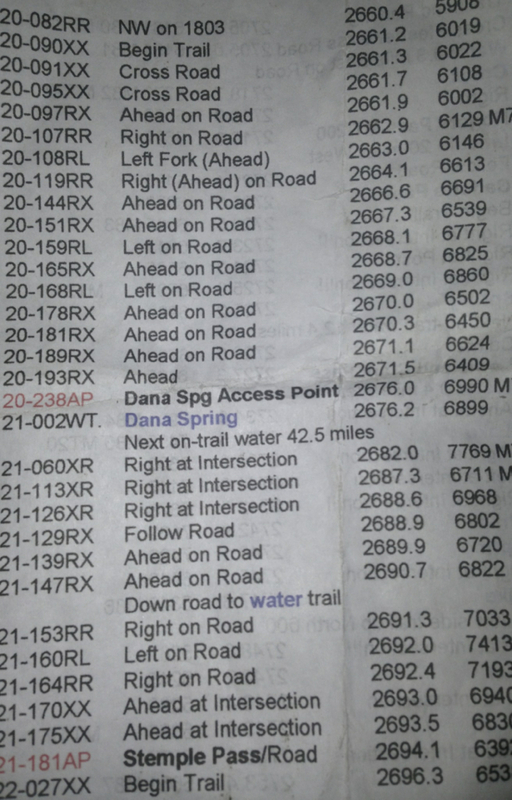 Beacon made a data book that combines the sources into one list of waypoints(on the left) along with mileage and elevations. My GPS has those points on the left column and the mileage is given. For example, at the top of the sheet, I am in Section 20. At mile 8.2 of that section I turn RR(Right on Road). In the description that road is 1803. On the right hand side is the elevation of that point at 5,908ft. If I turn on my GPS, there is a point labeled 20-082RR where I need to turn. Very helpful! I don’t know how people do this who don’t use GPS with all these unlabeled roads and turns. My one good water source today was this piped spring that was just a bit off trail. 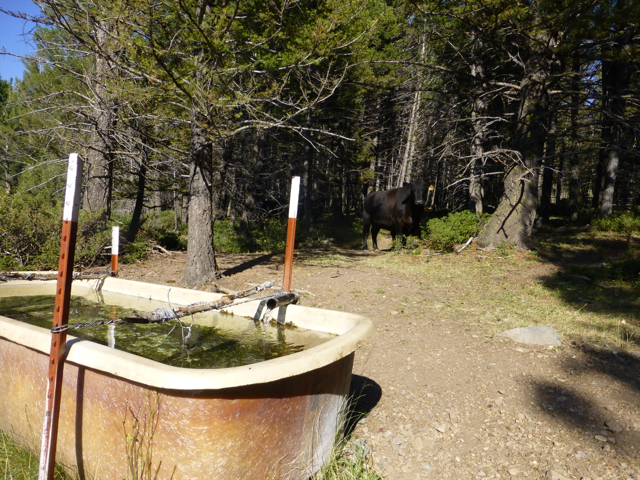 Check out the cow wondering when I’ll leave his drinking fountain. It was smooth sailing today and I started a new book titled Farewell to Manzanar. It is a short book my friend gave me about a family’s experience in one of the Japanese American camps during and after WWII. It is very interesting and definitely something I haven’t known much about, so I’m enjoying it. Thank you Chandra! I planned to hike til 8pm since it’s a short day out of town, but had to stop at 7:40pm because it got pretty gusty and there was a great patch of trees and a dip below a hill blocking the wind perfectly. I am in a bit of an open cow field, so there is little protection from the wind. With the haze from the fires, the sky was quite colorful with the sunset. I’m really enjoying these final days to myself and it was pretty magical do watch the sky and wisps of clouds change shape and color as I ate dinner. It was a great end to a very pleasant day!